Firearms on this page are listed alphabetically by manufacturer. Click on the picture to view the Full-Size Photo. Additional photos are available on request. Always check your State & Local laws before purchasing a firearm. 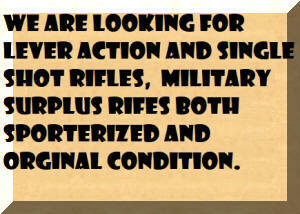 *All Cartridge Firearms must be shipped to an FFL Dealer unless specifically stated otherwise. Always check your State & Local laws before purchasing a firearm. 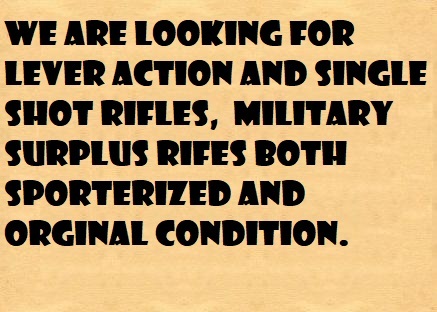 Come in and check out our vintage surplus ammo. 8mm, 30-06, Swiss, Russian, ect. Custom .45 Caliber shooting box. Shown with .45-120 it can hold everything from .45 Colt on up to .45-120. Holds 70 rounds. Solid wood the box measures 7.25 x 9.75 x 5.75. If you don’t want to carry plastic ammo boxes to your next long distance silhouette shoot this is the box for you!